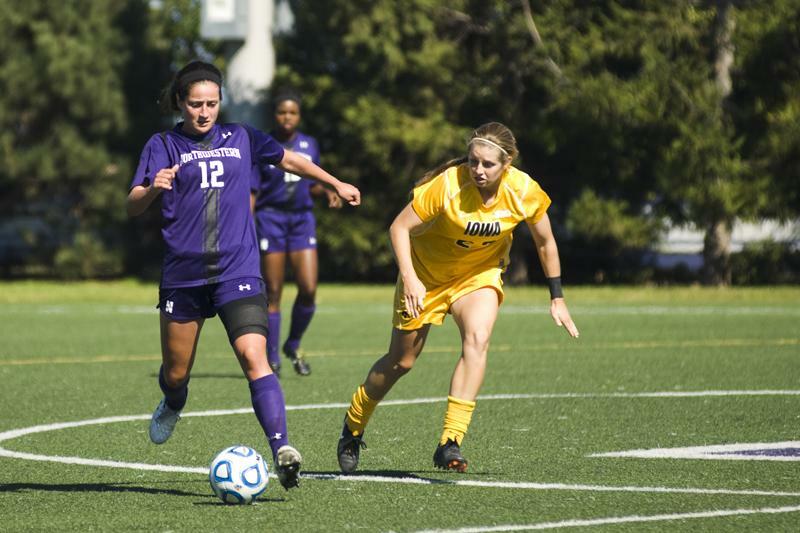 Margo McGinty handles the ball during Northwestern’s Sunday defeat at the hands of Iowa. The sophomore defender has played nearly every minute of the 2-7-2 Wildcats’ season. Northwestern still searches for its first Big Ten win this season after falling to Nebraska and Iowa this weekend. The Wildcats lost by 1 in both contests: 2-1 against Nebraska and 1-0 against Iowa. This weekend the Cats out-shot their opponents 43-21 but could only put one ball in the net. On the flipside, Nebraska was able to score twice on 10 shots while Iowa scored once on 11 shots. Senior forward Kate Allen took 15 shots this weekend — nine of which were on goal. “(Hitting shots) is definitely something we have to get better at and work on during practice and hopefully (results) will come in future games,” Allen said. Against the Cornhuskers, the Cats racked up 24 shots but only 1 goal off a penalty kick from Allen. Nebraska scored twice in the first half, but, NU was raring to go coming into the second frame. Against the Hawkeyes, the Cats had a few opportunities to score in the second half but could not capitalize. Hawkeye keeper Hannah Clark was not able to secure a save, and NU’s Schrakamp put it on goal only to have it knocked away by a Hawkeye defender. Later in the second half, Allen had two opportunities: the first nearly between the legs of Clark and the second just over the crossbar. Next weekend they face conference opponents Indiana and Purdue on Friday and Sunday, respectively. Last season, NU lost to both schools 1-0. If the Cats keep shooting like they did this weekend, they will be a formidable force for the rest of their opponents. The Big Ten tournament is still within reach for NU, Moynihan said. The Cats are getting ever closer to breaking open high-scoring matches. The players have been shooting all around the net; it’s only a matter of time until they reap the benefits.